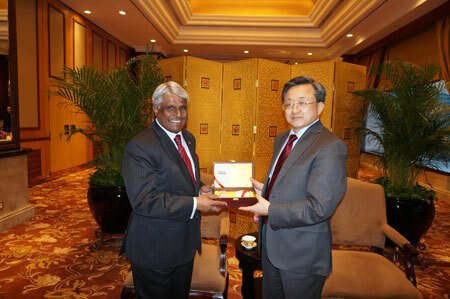 On March 17, 2014, Vice Foreign Minister Liu Zhenmin met with the outgoing Ambassador of Maldives to China Mohamed Rasheed. Liu spoke highly of Mohamed Rasheed’s contributions to China-Maldives relations, and hoped that he will continue to pay attention to and support the development of the bilateral relations in the future. Mohamed Rasheed thanked China’s long-term selfless assistance and support to Maldives, and said that he will continue to pay close attention to the development of China-Maldives relations after he leaves office and commit himself to increasing mutual understanding and friendship between the two peoples.